3. Neural Regeneration – Cyfuse Biomedical K.K. Previously, patients with nerve injuries have been treated by autologous nerve transplantation by collecting a normal nerve from the patient's own leg and then implanting it at the injured site. However, collection of an autologous nerve has limitations. In addition, although development of artificial nerves has advanced, it causes problems, such as numbness and pain. Thus, a new treatment option that is expected to greatly improve QOL without sacrificing the patient's own normal tissue is keenly awaited by patients with ruptures by accident or tumor resection and patients with difficulty in autologous nerve transplantation. 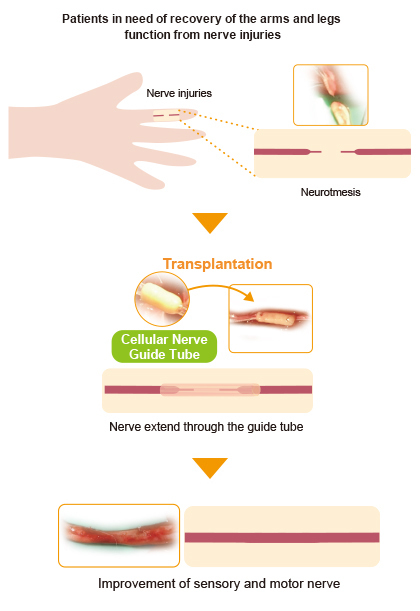 Currently, Cyfuse has successfully regenerated peripheral nerves using human neural tissue (neural induction tube) with its unique three-dimensional cell layering technology without the use of scaffolds under the suppor t of AMED, and confirmed that the regenerated peripheral nerve develops neural stem cells and neurons. Furthermore, a neural structure created from cells with our base technology was implanted in rats with an injured peripheral nerve, resulting in elongation of the nerve along the hollow of the structure to connect the defect sites and successfully regenerate the nerve. The efficacy data obtained indicate that this regenerated nerve has better tissue regeneration status than that from an artificial duct with earlier recovery in motor function. These study results were published in the American academic journal ‘’PLOS ONE’’ and prominent scientific journal ‘’Newton’’. From now on, Cyfuse is aiming to further advance this development of nerves created from cells and actualize the wor ld's f irst breakthrough treatment method where a neural structure is implanted for regeneration as individual tissue so as to provide a new treatment method for neurological diseases that was previously considered particularly difficult to treat, such as a spinal cord injury and cerebral infarction to rescue a number of patients.